Dogfight is a classic shoot 'em up arcade action game. The game supports English, Czech and Korean user interface languages. But, as you know, the most important is the language independent ACTION. 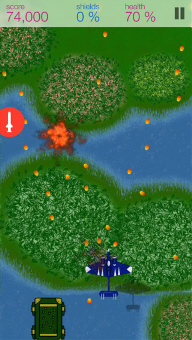 You attack enemies - airplanes, helicopters, rockets. Destroy all of them! Level one - Welcome, Greenhorn! The first level is just an introduction to the game. Several enemy airplanes and you are done. Level two - Check it out! In the next stage you should prove you are the real pilot. Are you able to clean this chapter for 100%? Airplanes, helicopters, rockets - all of them in numbers but no one is your friend. Are you able to clean all chapters for 100%? A special game mode for kids is also included. No violence, no missiles, no fires... Just nice handy painted airplanes flying over different rich sceneries, where kids can touch other airplanes and collect gold coins.